Draw me a picture of what you would look like if you turned into a monster.' 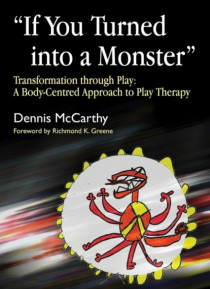 Dennis McCarthy's work with distressed or traumatized children begins with an exercise that is simple but very effective: he invites the child to communicate with him in their own way, through the non-verbal language of play.Using case studies from his clinical experience and with numerous children's monster drawings, McC… arthy lets the meaningful self-expression of the child take centre stage. He demonstrates that being allowed to play, move and draw impulsively and creatively in the supportive presence of the therapist is in fact the beginning of the therapeutic process. These activities are shown to be more therapeutic for the child in practical terms than the interpretation of the clues it provides about the child's state of mind.This very accessible book will be inspiring reading for play therapists and other professionals working therapeutically with young children and their families.